The Rough Riders of Teddy Roosevelt were the most heralded U.S. Army unit in the Spanish–American War. More formally known as the United States 1st Volunteer Cavalry, its men were a motley assortment of recruits – cowboys, miners, ranchers, stagecoach drivers, Texas Rangers and even Harvard glee club members! The famous unit also had a significant number of American Indians from Oklahoma and the Southwest, including Choctaws, Cherokees, Chickasaws, Creeks as well as Plains Indians. One of the most notable was the multi-talented Pawnee William Pollock (1870–1899), a painter as well as a warrior. In fact, Pollock listed “artist” as his occupation on his enlistment papers. “One of the gamest fighters and best soldiers was Pollock, a full-blooded Pawnee,” wrote Roosevelt in his memoir The Rough Riders. Pollock was one of eight Pawnee who joined the Rough Riders, continuing a tribal tradition of alliance with the U.S. Army. In the Highland Cemetery, approximately 60 miles west of Tulsa, Okla., an impressive monument stands today honoring the memory of the eight Pawnee who served in Company D of the Rough Riders: Sergeant Orlando C. Palmer, Corporal Calvin Hill, and Privates Arthur A. Luther, Joseph Proctor, Clyde H. and Clare H. Stewart, 20-year-old twin brothers, William O. Wright and William Pollock himself. This allegiance to the U.S. military developed during a century of declining fortune. In the early 19th century, the Pawnees, a confederated nation composed of four autonomous bands – Chauis, Pitahawiratas, Kitkahahki and Skiris [Skidis] – numbered more than 10,000. They were one of the largest and most powerful Plains Indian nations. They occupied a vast territory in what is today’s Nebraska and Kansas. They lived along the Missouri River in earthen lodges, cultivated maize, beans and squash, and depended on the buffalo for part of their subsistence. Hence, their economy was based on alternating patterns of horticulture and Plains buffalo hunting. Through much of the 19th century, they faced periodic epidemics of cholera, measles and smallpox that significantly reduced their population and weakened their resistance to their Indian enemies, the Cheyenne, Arapaho, Comanche and especially the Brule and Oglala Sioux. Moreover, because of the increased competition of Plains Indians for horses to track and hunt buffalo and the increased emigration of both whites and removed Indians into Kansas, the Pawnees’ territory and power were considerably reduced. Although they often allied themselves with the Mandan, Arikara, Wichita and Omaha, and dominated their neighbors, such as the Ponca and Otoe, they were no match for their traditional Plains Indian enemies. By 1860, the Pawnee population had been reduced to 4,000. Proud of their independence and hoping to maintain it, the Pawnees, like the Crows and Delawares, allied themselves with the United States, serving as valuable scouts to counter their Indian rivals. After disease, crop failures and losses of warriors in warfare, they became more and more dependent on the federal Indian agent and the U.S. Army for rations. By 1873, their numbers had been reduced to approximately 2,400 tribesmen. Caught between raids of their Indian enemies and starvation, the Pawnees were removed from Nebraska to the Indian Territory over a three-year period beginning in 1874. William Pollock was born in Nebraska three years before the start of the Pawnees’ relocation to Indian Territory. His birth name was “Tay-loo-wah-ah-who,” but he subsequently was referred to as Pollock, taking the name of a local federal Indian agent and cattleman. He came from an impressive lineage of warriors and chiefs and grew up hearing stories of great buffalo hunts and ‘”counting coups” in wars with the Plains Indian enemies. His interest in art began as a youngster when he started to sketch designs on wagons at the Pawnee Agency. After attending the government school at the agency, he was sent to the federal Haskell Indian Industrial School in Lawrence, Kan. While excelling in his studies, he played in the school’s marching band and decorated the wagons produced there, painting Indian portraits on the sideboards and eagles on the end-gates. 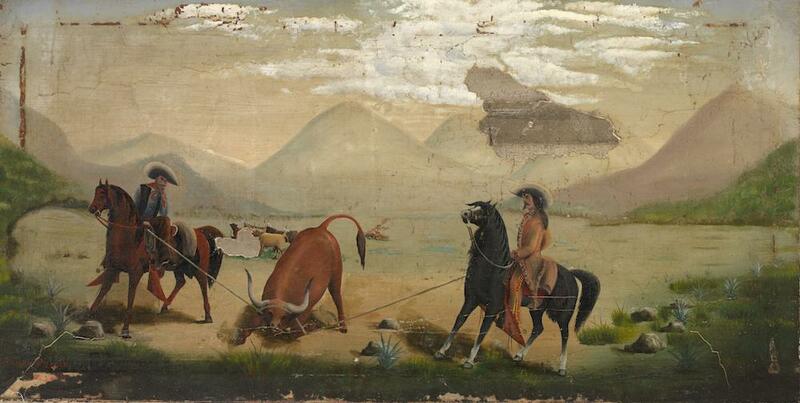 When Pollock returned from his schooling at Haskell to the Pawnee Agency, he secured a position at agency headquarters, but continued to paint in his downtime. In 1887, Congress had passed the Dawes General Allotment Act and two years later opened up the Indian Territory for non-Indian settlement, thereby establishing Oklahoma Territory. Disastrous congressional allotment policies that followed aimed to “civilize” the Indians by breaking up tribal lands and assigning parcels to individuals. In 1893, Pollock received his allotment of 160 acres, about three miles from Pawnee Agency headquarters. When the battleship Maine blew up in Havana harbor on Feb. 15, 1898, cries for war with Spain resounded in the United States. On April 24, the United States declared war on Spain, whose empire controlled Cuba, Puerto Rico and the Philippines. The fighting was to last 115 days. On May 5, 1898, at Guthrie, Oklahoma Territory, Pollock enlisted for two-year service in the U.S. Army. He was in part replicating what his kin had done in the past as Pawnee scouts in wars on the Great Plains. Now however, the Pawnees were no longer scouts, but full-fledged troopers, privates, corporals and even sergeants in the army. His muster roll indicated he stood five feet, eight inches, with dark complexion and black hair. He listed Eagle Chief of Pawnee, Oklahoma Territory as his “parent or guardian.” Significantly, Pollock gave his occupation as artist, not farmer or rancher. After Colonel Leonard Wood trained the men in San Antonio in April and the first part of May, they traveled by rail to Tampa to further prepare for their incursion into Cuba. 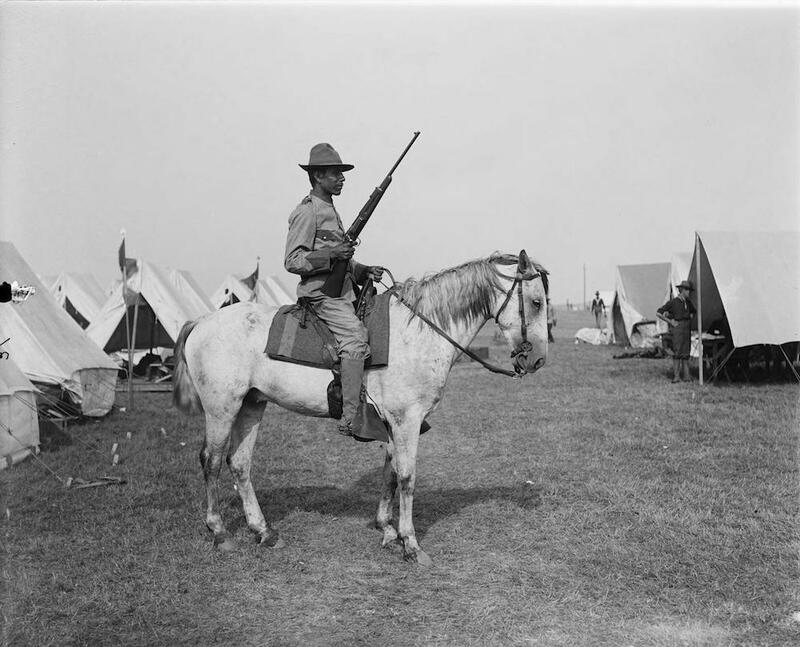 Although recruits from Oklahoma and the Southwest were already experienced horsemen, their training included refining their techniques of riding and shooting from horseback. After the stalemate at Las Guasimas, American forces, now totaling 8,000 troops and including the Rough Riders, marched on the Spanish forces at Santiago de Cuba. At that time, the city’s port housed the small, outdated and decrepit Spanish fleet. In the waters around the city, the United States Navy initiated a blockade to pen the Spanish ships in the port. Just two kilometers east of the city, 500 Spanish troops were dug in at Kettle and San Juan Heights. overlooking Santiago. Despite later images of the battle, Rough Riders, along with African-American soldiers of the 9th and 10th Cavalry regiments, charged up the hills on foot and overwhelmed the Spanish troops. Two days later, the U.S. Navy blew the Spanish fleet out of the water, in one of the two major naval battles of the war. The victory allowed the United States to begin a siege of Santiago de Cuba. It took another 10 days for the U.S. Army, including the Rough Riders, to complete the capture of the city. This Battle of Santiago de Cuba led to the Spanish surrender and the end of the Spanish–American War. 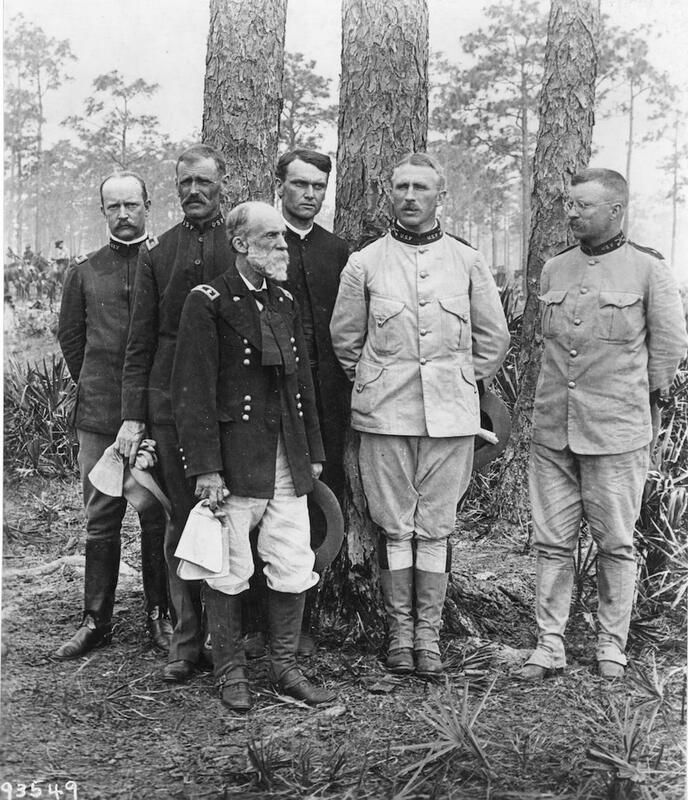 In his memoir, Roosevelt claimed: “No other regiment in the Spanish American War suffered as heavy a loss as the First United States Volunteer Cavalry.” An 1899 report of the United States Adjutant General’s Office recounted that of the more than 1,200 Rough Riders who fought in Cuba, 25 were killed in action or died later from wounds suffered in combat and 20 others died from disease. Perhaps because of the abysmal conditions, 12 were listed as committing suicide. However, statistics about American casualties and deaths during the Spanish–American War can’t be trusted as accurate, largely because of the unusually high number of troops who perished after the fighting from typhoid and tropical diseases contracted in the conflict. One estimate is that 87 percent of the deaths in the war and in the Philippine Insurrection that followed were caused by typhoid fever and yellow fever, and that malaria weakened sick and wounded soldiers, making them susceptible to other diseases after the fall of Santiago de Cuba. Roosevelt bemoaned army field hospitals during the war as “frightfully beyond description”; they lacked medicine, doctors, nurses and attendants. He wrote that half of his troops were ravaged by “Cuban fever,” malaria, just before the surrender and that ailing soldiers were hardly able to carry supplies and their mess kits, let alone walk. Indeed, once the Rough Riders left Cuba after the Spanish surrender in August, the unit was quarantined for a month at Camp Wikoff at Montauk, Long Island. Private Pollock was one of those affected by the Cuban fever. On September 15, the quarantine was lifted and Pollock returned to Pawnee, Oklahoma Territory. He had made a decision to join Billy McGinty in Buffalo Bill’s Wild West show and signed a contract for a tour including performing at Madison Square Garden in New York City. But because of declining health undoubtedly caused by Cuban fever, he abandoned his plan. On March 8, 1899, approximately six months after his return, he died at the age of 28. 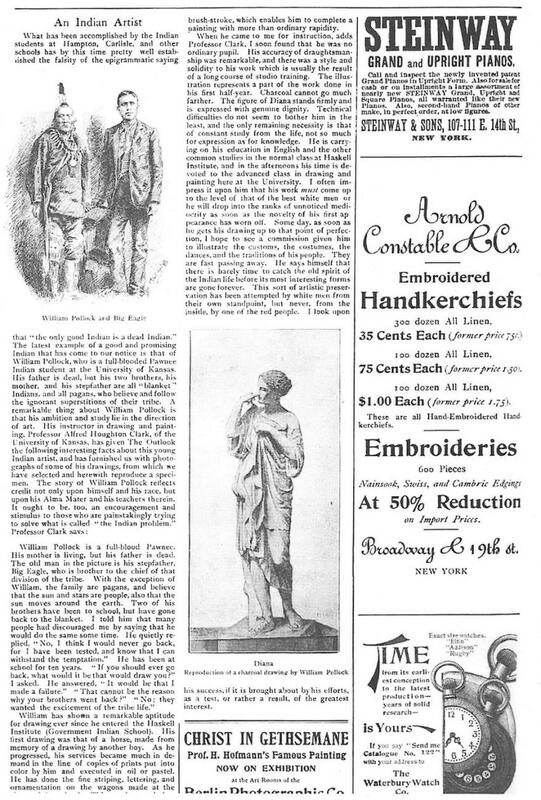 The Dallas Morning News reported on his death the next day: “William Pollock, a full-blood Pawnee Indian, who was one of Roosevelt’s Rough Riders, died yesterday of pneumonia complicated with Cuban fever from which has been in his system since his return from Santiago.” He was buried with full military honors in Pawnee. Subsequently the Veterans of Foreign War Post at Pawnee was named in his honor. Laurence M. Hauptman, a frequent contributor to American Indian magazine, is SUNY Distinguished Professor Emeritus of History.